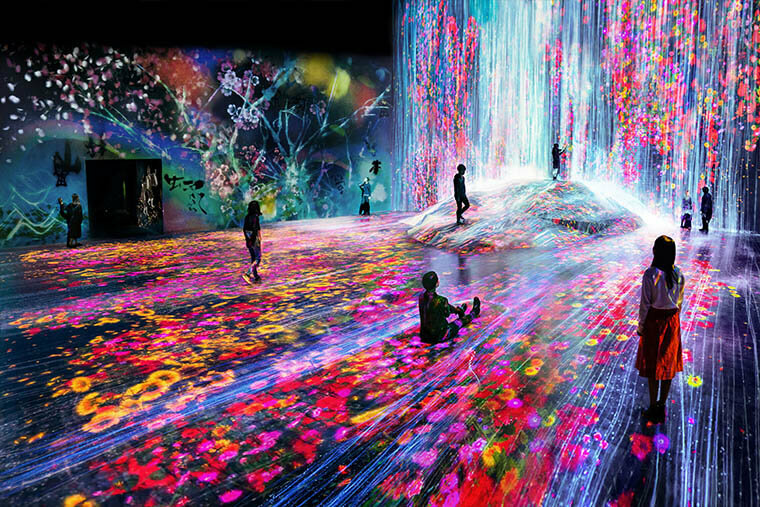 If there’s anywhere in the metropolis where you’ll feel unbounded by space, it’s at the two signature teamLab venues. Even time seems to warp in these otherworlds uniting art with technology. 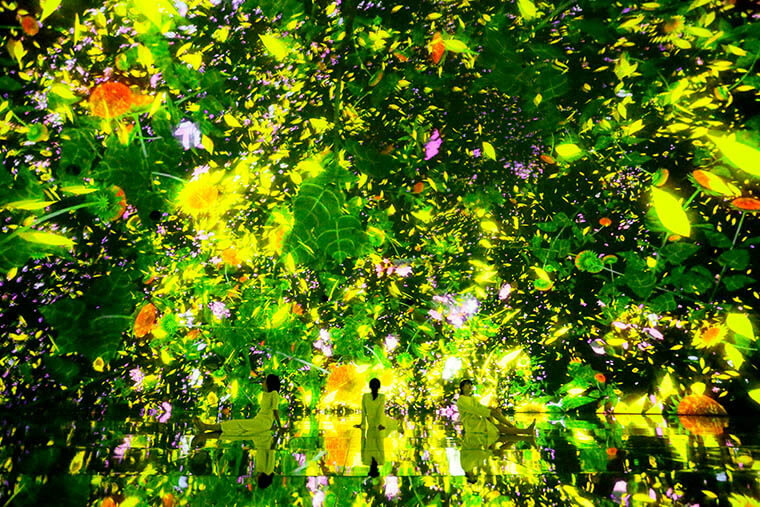 The prolific teamLab collective of artists, programmers, engineers, animators, mathematicians, and architects showcases its talents at short-term exhibitions and any number of permanent and long-run venues across Japan and abroad. 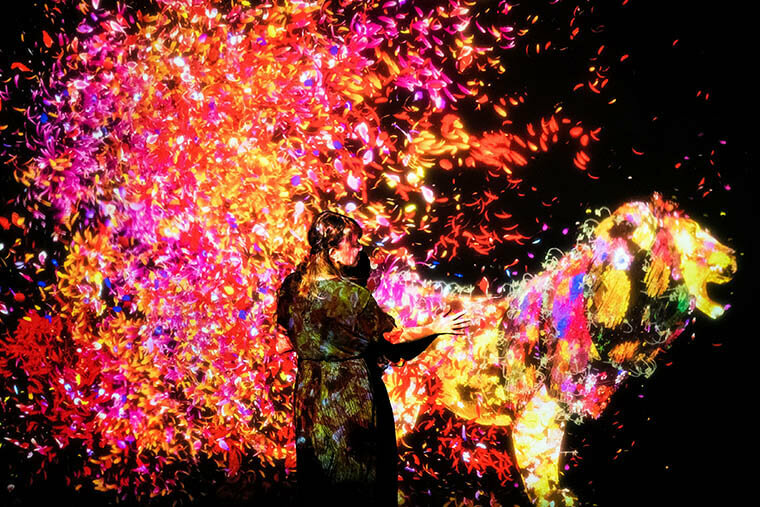 In Tokyo, the teamLab Borderless and teamLab Planets attractions in the Odaiba and Toyosu districts, respectively, are tours de force of experiential art, delivered in teamLab’s signature way that draws upon people’s naturally inquisitive, creative nature. As people do just that across five different zones and through some sixty different exhibits, elements of the artworks, too, move from one installation to another freely, forming connections in constantly changing ways. The more you interact with the imagery, the deeper your experience of it becomes. And because the displays are rendered in real time by complex computer programs, what you see will never appear again in exactly the same way. The central space features simulated water cascading over a buttress of rock. The water’s flow is altered by the presence of people as they climb, sit, jump and meander amid swirling displays of flowers, butterflies, birds. Elsewhere, focused activities like drawing, playing with oversized blocks, or interacting with tiny tabletop figures are good ways to give younger children a break from some of the more eye-popping displays. Plan on spending a few hours, even a full day, at Borderless. One of teamLab’s key premises—that learning is not only more fun but also more effective when using one’s whole body—comes to the fore at Planets, where the exhibits are still more sensually immersive. From beginning to end you move through the spaces barefoot, experiencing different textures of terrain and even wading through water at times. The deep matte black of the walls, floor and ceiling here make the projected artworks really pop. 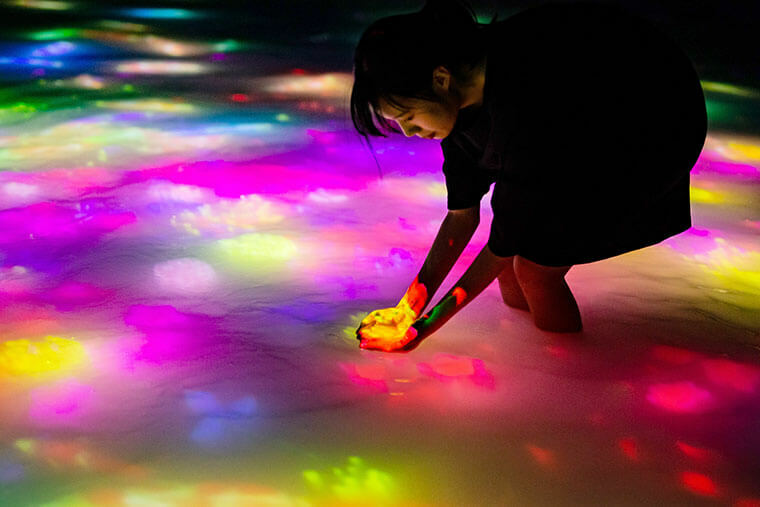 As at Borderless, there are crystal infinity rooms and massive illuminated spheres that shift colors as you squeeze around them, but the feeling of being dissolved into these experiences is much more pronounced. It all ends more quickly, too—it’s possible to complete your tour of Planets in less than an hour. What you will have seen and felt, though, is so rich you’ll likely be surprised at how little time has gone by. Smaller children will need assistance navigating the mushy “Soft Black Hole” and the water-filled installations. In the pool where animated koi dart playfully, the water is knee-deep for adults. The interactive exhibits offer fun for ages four and up, but pace yourself and take advantage of the break rooms as necessary. Detour routes are available for those who need them. Advance reservations are recommended for both venues, and be sure to read the guidelines about what to wear.